A sci-fi thriller. 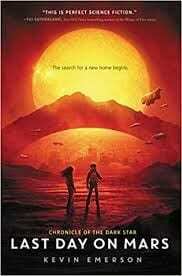 Liam and Phoebe, who have grown up on Mars, are prepared to leave with 100 million passengers on board the Scorpius when their planet becomes uninhabitable–but are left behind when an explosion decimates their parents’ terraforming lab. Robots, extraterrestrials, and a universal struggle for survival. The first of a trilogy. This book is amazing. I love sci-fi. I LOVE THIS BOOK IT IS SO GOOD EVERYONE SHOULD READ THIS!!!!! OMG one of the BEST books ever made in human existance.